At FiveThirtyEight, we use census data all the time to track demographic and social trends, from the aging of the U.S. population to the decline in marriage and shifting immigration patterns. But the census not only reveals societal changes, it responds to them. This week, we’re taking a look at three changes that the Census Bureau is considering for its 2020 questionnaire. First up: the proposed addition of a new racial category for Arabs. The next time he fills out a census form, Al-Dabbagh may not have to search so hard. The Census Bureau is considering adding a “Middle Eastern/North African” category to its questions on racial and ethnic background in the 2020 census. There is more than identity at stake. The government uses census data to help track discrimination in housing and employment, to draw congressional district boundaries and to allocate federal funds. Researchers use it to investigate racial disparities in income, education and health. And advocacy groups say accurate data is especially important at a time when Americans of Middle Eastern origin have been targets of discrimination, hate crimes and government surveillance. Al-Dabbagh, who serves on the board of the Network of Arab-American Professionals, a national nonprofit, said the numbers are critical for another reason: political power. The Census Bureau does provide an estimate of the number of Arabs in the U.S.: 1.8 million as of 2013.1 But since there’s no Arab category on the main census form, that figure is based on a separate question about “ancestry or racial origin” on the much smaller American Community Survey. The Arab American Institute Foundation, an advocacy group, believes the census’s estimate is far too low, something the Census Bureau doesn’t dispute. The Institute puts the figure at about more than double the government number — at 3.7 million. “We know with a certainty that there has always been a dramatic undercount, and the simple reason for that is that there’s no real estate on the census form for us,” said Maya Berry, the Institute’s executive director. 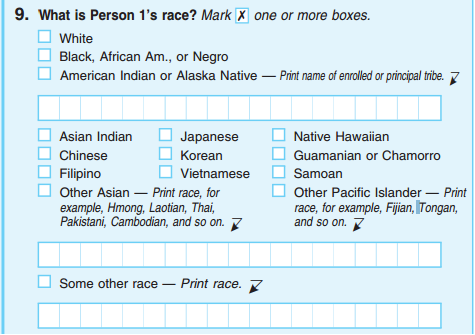 The 2010 census asked two questions about racial and ethnic background: The first asked about whether a person was “of Hispanic, Latino, or Spanish origin.” The second asked about race and offered 14 categories, plus a 15th option for “some other race,” with an opportunity to write in an answer. Many Arab-Americans still check “white” on the census. But in 2010 some Arab-American groups urged their members to choose “other” instead, using the slogan “check it right, you ain’t white.” Their hope was to help get a better count of the U.S. Arab population. Both Al-Dabbagh and Berry, who was born in Lebanon, said they don’t consider themselves white, or believe that they are perceived as white by the general public. “I’ve always seen myself as a woman of color, that’s how I’ve always identified,” said Berry. But Berry said that she knows many Arabs who do identify as white. 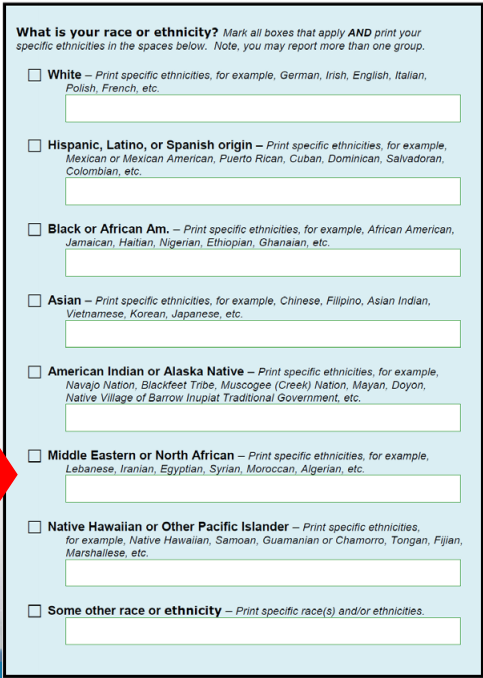 The Arab American Institute has proposed adding a question to the census asking whether a person is “of Middle Eastern or North African origin.” Like the current question on Hispanic origin, the question would be distinct from the separate question on race, meaning Arabs could still check “white” or any other racial category. The census is instead considering a more dramatic change that would combine the race and ethnicity questions into one and add a “Middle Eastern or North African” category.3 As they can now, respondents could choose multiple racial or ethnic categories. The proposal must still be approved by the Office of Management and Budget and, ultimately, by Congress. Robert Kominski, a Census Bureau demographer, said that whatever the final form of the question, it’s important that the census keep up to date with people’s changing self-identification when it comes to race and ethnicity. Even if the new question is added, however, it may not immediately resolve the under-counting issue. Some Arabs have expressed reluctance to identify themselves on a government form, especially after the Census Bureau shared detailed data on the Arab-American population with the Department of Homeland Security in the early 2000s. Samia El-Badry, an Egyptian-born demographer in Texas, said it will take time for Arabs and Arab-Americans to become comfortable checking the new box. The census defines “Arab” as anyone who reports his or her ancestry as Algerian, Bahraini, Egyptian, Emirati, Iraqi, Jordanian, Kuwaiti, Lebanese, Libyan, Moroccan, Omani, Palestinian, Qatari, Saudi Arabian, Syrian, Tunisian or Yemeni. The new category would include not just Arabs but also others of Middle Eastern origin, such as Kurds, Iranians and Armenians.